Hotels-New-Zealand is a group of independently owned and non-related hotels, motels and serviced apartments providing accommodation located across Te Anau New Zealand. Hotels New Zealand allows you to deal directly with the hotels giving you the best possible rates for these Te Anau hotels. Book your accommodation online directly with the hotels in Te Anau and save !!! The Fiordland Hotel Resort is a 3.5 star resort, situated in a tranquil four acre garden setting overlooking Te Anau. All of these quality Te Anau accommodation rooms have a picturesque, panoramic, million dollar view of the lake, mountains and the rural landscape. The Fiordland Hotel is an easy walking distance to the shores of Lake Te Anau and also the Te Anau town centre. With a wide variety of accommodation rooms to suit the budget of every traveller the Fiordland Hotel Motel Resort is a great place to relax and enjoy your next holiday to southern New Zealand. All motel and hotel guest accommodation includes colour TV, sky TV, in-house movies, private en suite bathroom with bath and shower, direct dial phone, tea, coffee and biscuits. The Fiordland Hotel Te Anau includes 2 restaurants with one of the best views in town, a fully licensed House Bar, a public bar with pool table, jukebox and casino, a multi-function centre to cater for large functions, a solar heated swimming pool complex with spa pools, a large gas Barbecue and a fenced children's play area. Use these discount Te Anau accommodation as a base for full day trips to Doubtful Sound and Milford Sound, walking tracks in the Milford, Routeburn, Greenstone and Kepler Tracks and Te Anau's unique Glow Worm Caves. Other outdoor activities around Te Anau include horse riding, farm visits, trout fishing, hunting, sailing, kayaking, scenic helicopter or airplane/floatplane flights and the attractive 18 hole Te Anau Golf Course. The Luxmore Hotel in located right in the heart of the town centre of Te Anau. It provides families and holiday makers with the ideal hotel accommodation only a short walk from shops, restaurants and cafes as well as the spectacular Te Anau Lake. Alternatively you can enjoy a delicious meal from the buffet carvery at the Hilights Restaurant with its magnificent panoramic views of the township and surrounding mountians. With conference facilities and both standard and superior accommodation rooms available the Luxmore Hotel Te Anau is perfect for your next relaxing holiday in the South of New Zealand. The Lakefront Lodge ia a modern, up-market motel which offers superior Te Anau accommodation and friendly customer service. Guests who stay at the Lakefront Lodge can enjoy the stunning scenery of the Fiordland World Heritage National Park, visit the famous Milford & Doubtful Sounds, Glow worm caves or walk the Milford, Kepler, Routeburn, Hollyford or Dusky tracks. From this luxury Te Anau accommodation you can stroll across the road to Lake Te Anau's beautiful shore or take a short walk along the lakefront to local restaurants, visitor information centres and the town centre. iAll of the ground floor units at the Lakefront Lodge Resort are serviced daily and include a kitchen, microwave, shower, hair dryer, queen size beds, electric blankets, heating, phone, wireless broadband internet access, 5-channel Sky Digital TV, guest laundry and use of themotels barbecue area. The Campbell Autolodge is situated on the shores of the picturesque lake and provides quality Te Anau accommodation at the gateway to the Fiordland National Park. The luxury, self catering, apartments at Campbell Autolodge Resort offer you the ideal base from which to visit this World Heritage Listed Park. Other recreational activities around the region include trekking, hunting, fishing, kayaking or just relaxing and enjoying the magnificent scenery. The helpful and friendly staff at this Te Anau accommodation know a lot about this special part of the world, which willmake your Fiordland experience the highlight of your New Zealand holiday. The Campbell Autolodge features luxury, self-contained and spacious 1 bedroom apartments, all with kitchen, microwave, 2-element hotplate, tiled bathroom with bath and shower, hair dryer, broadband internet connection, Sky TV, electric blankets and central heating. The Edgewater Motel has the best location of any Te Anau hotels, ideally situated a stones throw from the shores of magnificent Lake Te Anau and the Fiordland World Heritage National Park. Here you will find a range of Te Anau accommodation which is perfect for families, couples and singles including motel rooms as well as one and two bedroom apartment units ranging from from budget to luxury. A short 5 minute lakeside walk from the Edgewater Motel is the Te Anau town centre where there is a wide range of supermarkets, restaurants, souvenir shops, bars and cafes. At the Edgewater Motel visitors can book many Te Anau activities and transport requirements including the Original 'Piopiotahi Tour' to Milford Sound and the Doubtful Sound Cruises. All of these Te Anau accommodation units have a fully equipped kitchen, microwave, fridge, ensuite bathroom with shower, 4-channel Sky Digital TV, wireless internet, electric blankets, heating, hair dryer and use of the resorts outdoor entertainment area with gas barbecues, onsite laundry and off-street parking. The comfortable and very affordable Fiordland Hotel / Motel is conveniently situated only 300 metres from lake Te Anau and all of the accommodation rooms feature paroramic views of the lake. Other features at the Fiordland Hotel Te Anau include a restaurant, bar, guest lounge, swimming pool, spa, BBQ area, guest laundry tour desk and baby sitting service. This and many other features makes the Fiordland Hotel and Motel the ideal place to stay when you next visit Te Anau. In a quiet, sheltered location close to Lake Te Anau the Arran Hotel is the ideal holiday accommodation in Te Anau for guests looking for an affordable place to stay. Only a leisurely 10 minute walk from the Te Anau town centre these modern 1 and 2 bedroom fully self contained apartments feature full kitchen facilities, Queen size beds, Sky TV, in-house videos, guest laundry, free off street car parking and a comprehensive tour booking service for all of Te Anau's local tourist attractions. 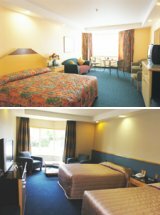 The Bella Vista Motel & Apartments in Te Anau sets the standard for quality accommodation in New Zealand. These modern studio and 1 bedroom apartments are completely non smoking, serviced daily, only 2 minutes walk from the town centre and a 1 minute walk to Lake Te Anau. The luxury apartment accommodation provided by the Bella Vista Motel also includes cooking facilities, Sky TV, electric blankets, heating and even spa bath apartments are available for the discerning holiday makers. The Campbell Autolodge is one of New Zealand's finest motels and is superbly sited on the shore of Lake Te Anau with spectacular views of the lake and nearby mountins from every accommodation unit. Fully refurbished in 2004 the Campbell Autolodge provides accommodation features such as fully equipped kitchen, King or Queen size beds, broadband internet connection, Sky TV, electric blankets, central heating, guest laundry and off-street parking. Wonderful Te Anau accommodation that the entire family will enjoy. Situated in a quiet peaceful surroundings complete with spacious lawns and gardens the Explorer Motor Lodge offers holiday travellers luxury 2 bedroom apartment accommodation with spa bath and kitchen facilities. The resort style hotel facilities at this discount Te Anau accommodation include continental breakfast, safe children's play area with trampoline, barbecue, guest laundry, luggage storage and off-street car parking. The Explorer Motel Te Anau is just a short 2 minute walk from the town centre and Lake te Anau. The modern upmarket accommodation provided by the Lakefront Lodge Te Anau is comfortable, relaxing and very affordable. It provides the perfect holiday accommodation for travellers wanting to explore everything that the South Island of New Zealand and Fiordland has to offer. All of the designated non-smoking apartments feature a kitchen with microwave, hair dryer, queen size beds, electric blankets, heating, phone, wireless broadband internet access, Sky Digital TV, guest laundry, barbecue and safety deposit boxes. The Lakefront Lodge Te Anau is also able to organise Fiordland sightseeing trips including Doubtful Sound and Milford Sound. One of the newest accommodation in Te Anau the Matai Lodge has been specifically designed for the discerning travller. All of the motel rooms include and ensuite bathroom, fridge, TV and tea & coffee making facilities. There is also a communal, fully equipped kitchen and comfortable lounge area for socializing in. The Matai Lodge Accommodation Te Anau has great value discount rates available and will be sure not to break the budget for your next family holiday. The Radfords Lakeview Hotel Te Anua is Qualmark rated 4 star, is fully self-contained and serviced daily. This makes it the perfect Te Anau accommodation for guests who are looking for an affordable holiday in the South Island of New Zealand. Located just a 3 minute walk to the shops and restaurants in the Te Anau town centre the Radfords Lake View Hotel Te Anau will be sure to make your stay in this picturesque part of Fiordland is both relaxing and memorable. 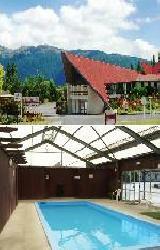 For budget Te Anau accommodation you can't go past the Te Anau Lake View Holiday Park. This discount Te Anau accommodation is ideally positioned on spacious grounds overlooking Lake Te Anau and only a 10 minute lakeside walk from the town centre and opposite DOC Great Walks centre. The holiday park facilities include wireless internet access, on-site Sky TV, internet kiosk, card phone, small shop, spa bath and family bathroom, sauna, barbecue and children's playground. There is also Free activities information and tour bookings to Doubtful and Milford Sound at the Te Anau Lakeview Holiday Park. The Lakeside Motel Te Anau is situated on the shore of Lake Te Anau commanding a spectacular view of the crystal clear blue lake and surrounding mountains. The Lakeside Hotel Te Anau is also only minutes away from the town centre and all of the local tourist attactions including boating, fishing, bush walking and sight seeing. This quality Te Anau accommodation also provides its holiday guest with a free courtesy car pick-up and drop-off at all transport terminals.